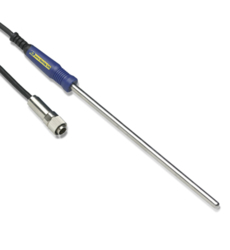 The PB-6005-1M5 is a general purpose stainless steel probe with a 1.5m cable which monitors from -50°C to +300°C. It is suitable for a variety of high temperature applications, from monitoring of oven temperatures to core temperature of food products. Its moulded plastic handle and connector ensure it is robust and waterproof. This probe is also available with a 3m cable (PB-6005-3M).